April 25, 2012 By arzea 13 Comments This post may contain affiliate links. Read my disclosure policy. Often when we go out to dinner I see something on the menu like Cajun Pasta. 100% of the time it is Cajun Pasta with Chicken, and usually when I ask for no chicken, it is brought to my attention that the chicken has already been cooked in with the sauce. Major fail. It would be so easy to make the sauce and chicken separately, and substitute something like broccoli or mushrooms in place of the chicken. No dice. 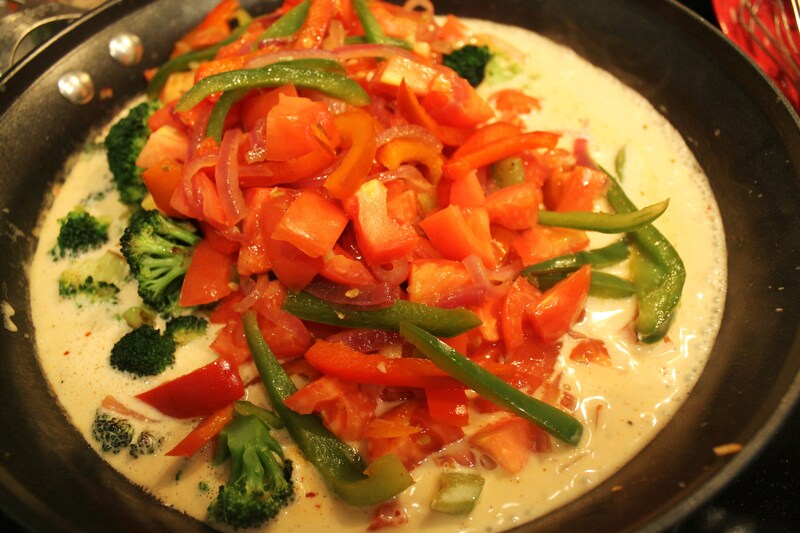 Most places are happy to add chicken or meat to anything, but often find it difficult to serve without it. This also reminds me of a time when I found a delicious sounding salad, Blue cheese, pine nuts, cranberries, spinach leaves, and filet. I really wanted to order the salad sans filet, but I couldn’t justify ordering a $17.99 salad when leaving off the costliest ingredient. Oh well, is the life of a vegetarian. There are tons of delcious vegetarian restaurants and menu items out there, so I shouldn’t complain…but it just shouldn’t be so hard to leave the chicken/meat out! Enter ‘Cajun Chicken Pasta’. I love The Pinoneer Woman. Her recipes always look super appetizing and amazing. I found this recipe on pinterest and I knew I had to make it. Cajun spice? LOVE. Spicy pasta? LOVE. Peppers, onions, garlic? LOVE. This dish was after my heart. With chicken being the main ingredient, I knew I had to sub it with something. I am guessing it would have probably been good just leaving it out, and using the onions/peppers as the featured ingredient, but I decided that broccoli could be a good replacement. 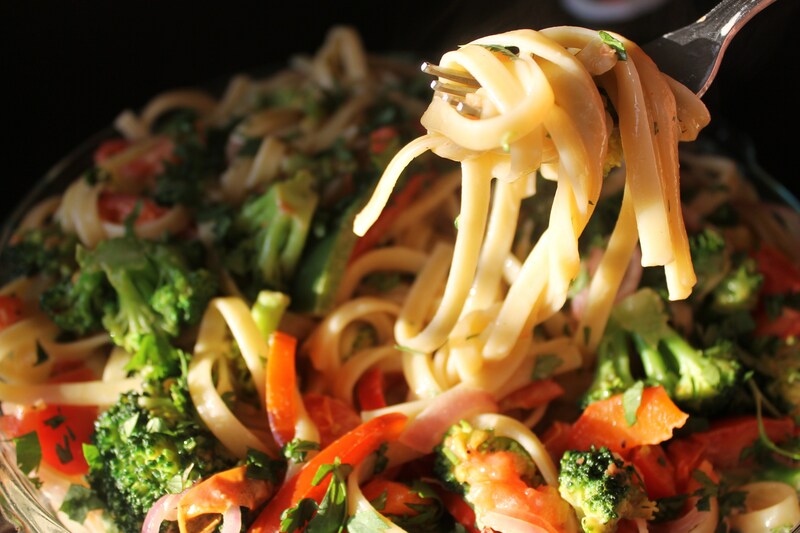 Who doesn’t love broccoli in pasta? Come on. I also made the recipe a tad healthier by subbing half and half in place of heavy cream, and using a bit less oil while cooking. I think for a pasta dish this is fairly healthy. This dish turned out so well that my husband ate about half of it in one sitting. It was so flavorful and it had the perfect amount of spice to get your tongue tingling. It wasn’t difficult to make, however there was a bit of prep work, and the outcome was well worth all the work put into it. Since this recipe did have meat originally, you could obviously use meat in your recipe. 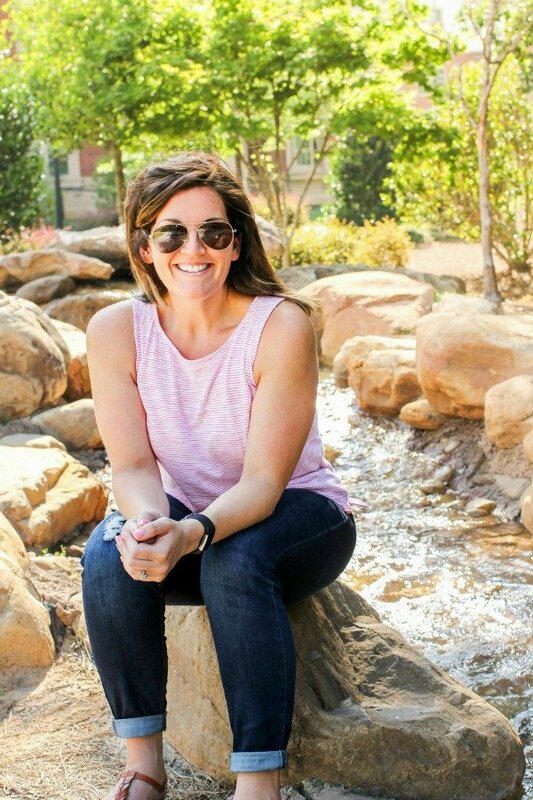 Pioneer Woman recommend chicken, sausage, shrimp, or crawfish. You can find her recipe here. For the meat free take on this recipe, continue down. Broccoli out and peppers/onions in! Cook pasta according to package directions. Drain when pasta is still al dente; do not overcook! Add water to skillet, and then add broccoli. Sprinkle 1 1/2 tsp Cajun spice over broccoli and stir. 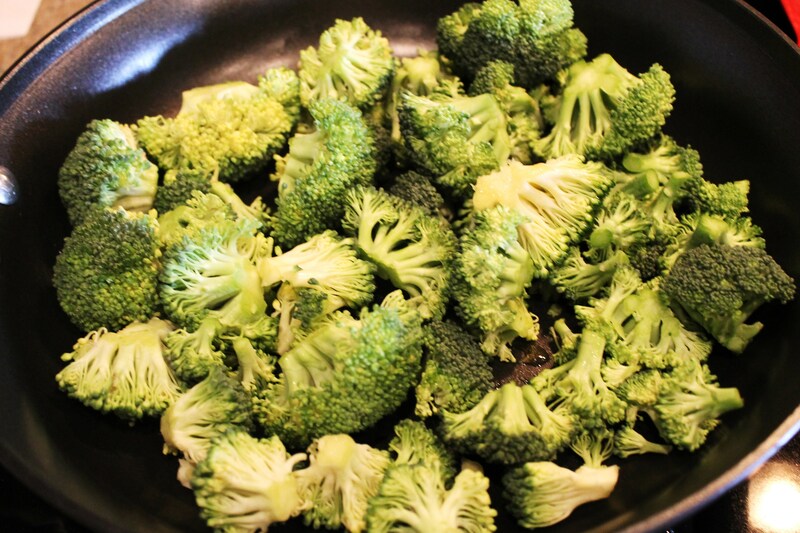 Let broccoli cook for 2 minutes and remove from pan, set aside. Add olive oil and butter to pan. 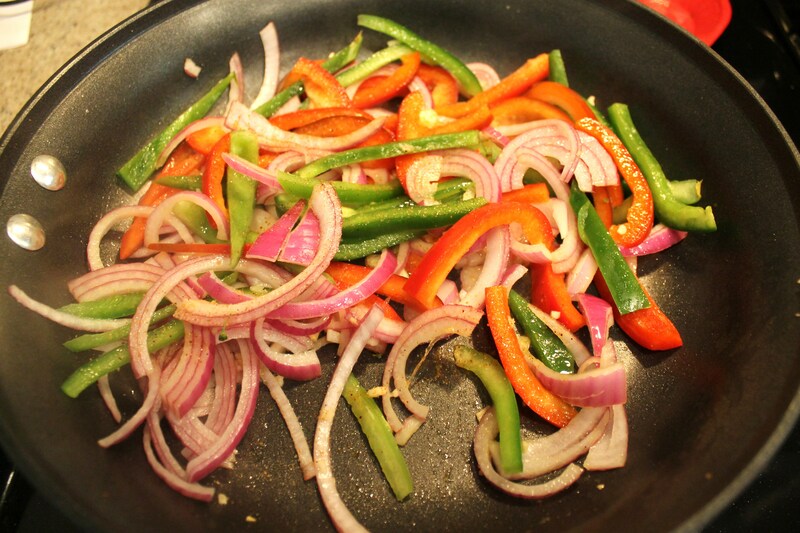 When heated, add peppers, onions, and garlic. Sprinkle on remaining Cajun spice, and add salt if needed. Cook over very high heat for 1 minute, stirring gently and trying to get the vegetables as dark/black as possible. 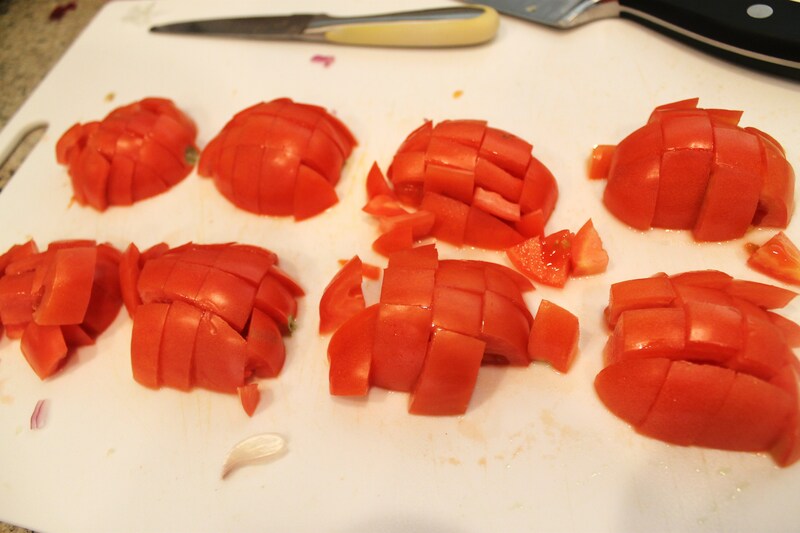 Add tomatoes and cook for an additional 30 seconds. 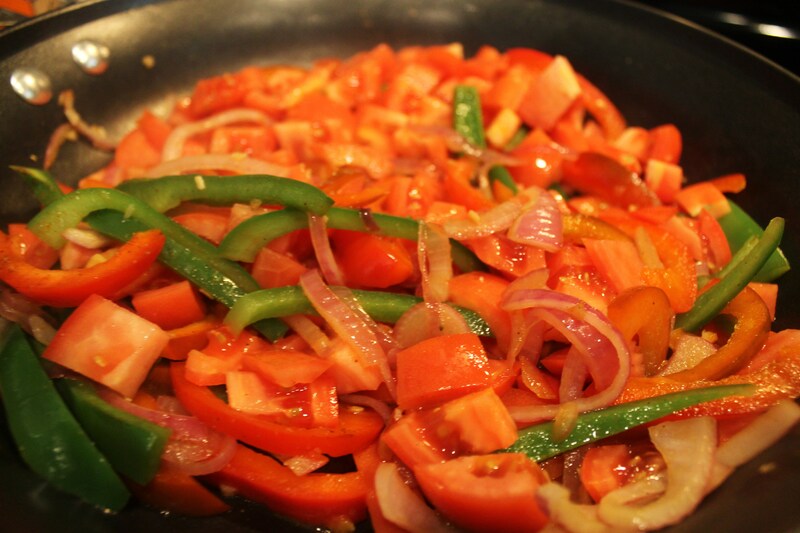 Remove all vegetables from the pan. With the pan over high heat, pour in the wine and vegetable stock. Cook on high for 3 to 5 minutes, scraping the bottom of the pan to deglaze. 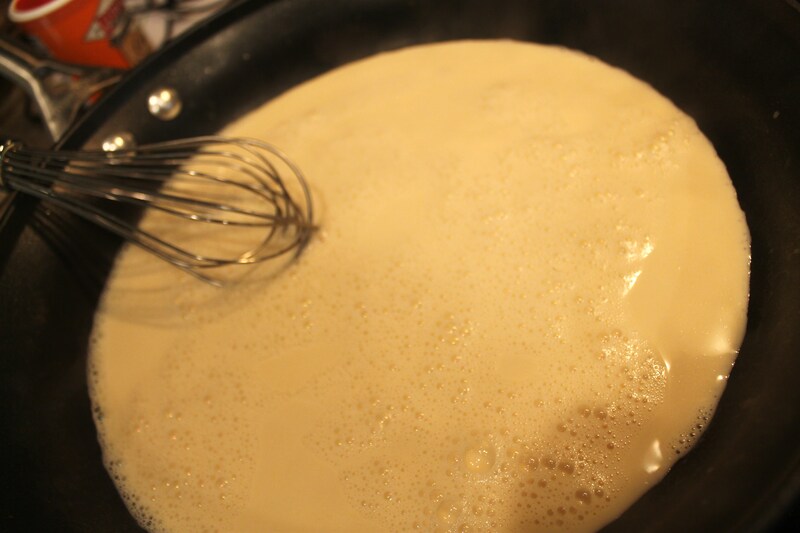 Reduce heat to medium-low and pour in half and half, stirring/whisking constantly. 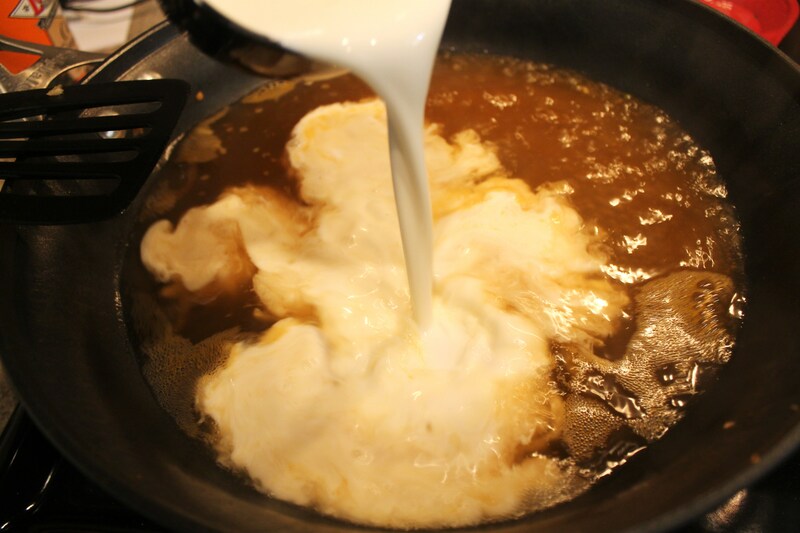 Cook sauce over medium-low heat for a few minutes, until cream starts to thicken the mixture. Taste and add freshly ground black pepper, cayenne pepper, and/or salt to taste. Sauce should be spicy! 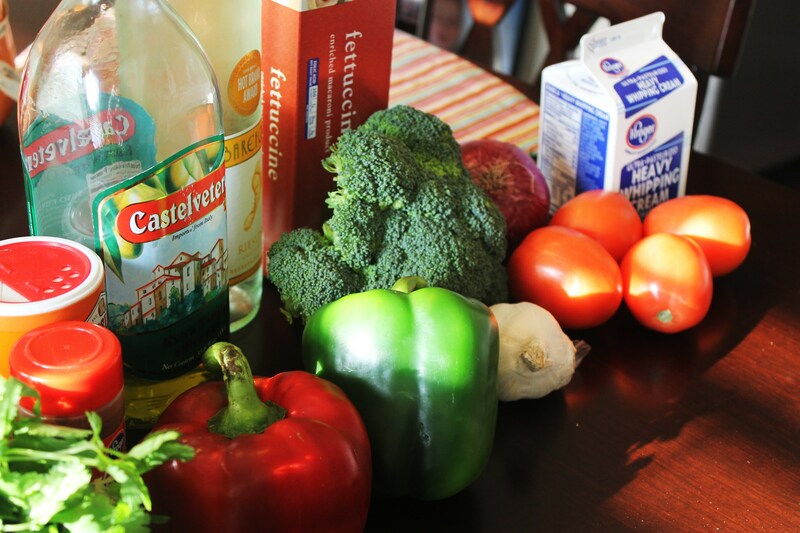 Finally, add broccoli and vegetables to sauce, making sure to include all the juices that have drained onto the plate. Stir and cook for 1 to 2 minutes, until mixture is bubbly and hot. Add drained fettuccine and toss to combine. 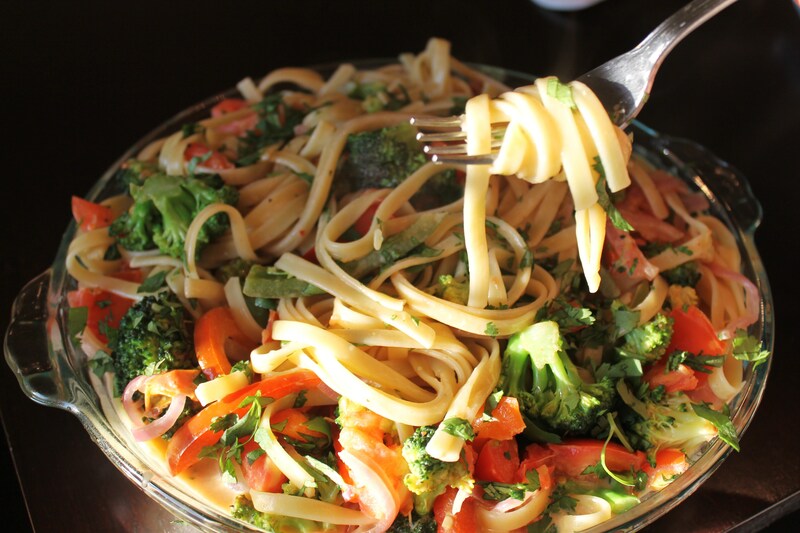 Top with chopped fresh parsley and enjoy! This recipe has 10 WW points per serving if using the fat free versions (how the recipe is listed), and it takes it up to 12 if you use real butter and reduced fat half and half. Thank you for the detailed instructions for this receipe, I can’t wait to give it a try and offer it to the kids. You’re welcome! I hope they enjoy it, it’s spicy! What a lovely idea! That’s so very pretty. Well maybe in Aug or Sept when I’m back in CA… will see where life leads me! But YES, I would LOVE to SEE You and your beautiful family. I don’t know how many years it’s been but it’s been TOO many! How many servings in this recipe? I’m looking for something to last about 3 days for 2 people. 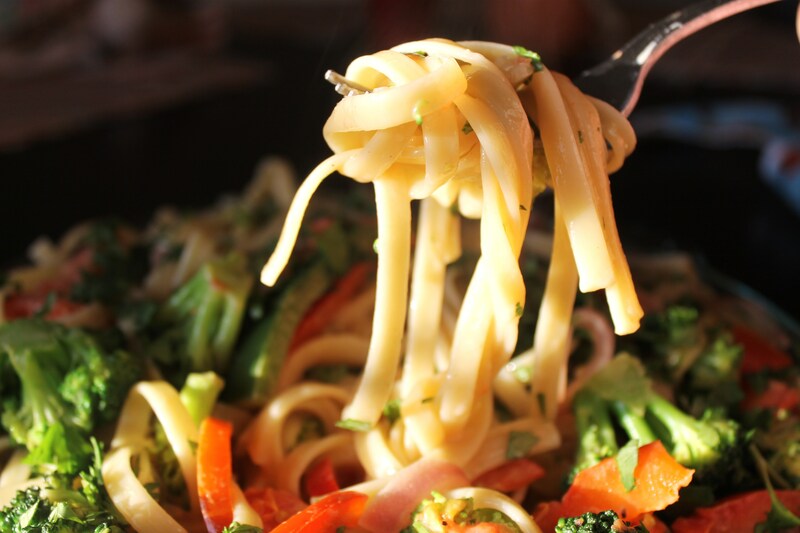 It really depends on how much you eat, but I could see it lasting that long if you eat a regular portion of pasta. Looking for a main course dinner, not a side. I am about to endeavor to cook this recipe that looks so delicious, as many have commented on The Food Network for Ree Drummonds Cajun Pasta Chicken. However, I have a question and I know it sounds stupid but I will ask it anyway. Your directions say: “Add water to skillet, and then add broccoli. Sprinkle 1 1/2 tsp Cajun spice over broccoli and stir. Let broccoli cook for 2 minutes….” I assume you want the water to boil first before placing the broccoli in the water? I made this. Good enough to make it a keeper. The first day eating it, it was okay. By the second day, the flavors had married and it was much better. I doubled the Cajun spice mix, added an extra bell pepper, sliced a whole onion instead of a half, added some sliced mushrooms, added the garlic later than recommended, since garlic loses its flavor if cooked too long. I also cooked the fettuccine al dente, after blanching the vegetables rather than boiling the noodles before cooking the meal and having them sit for too long while they got clumpy and sticky. I also kept the heat up to medium high when pouring in the half and half so it would thicken, which it didn’t. I also used regular half and half and not the fat free version. Once the meal was done, I took it off the heat and allowed it to rest for about 10 minutes, not only because it was way too hot to eat immediately but because I was hoping the sauce would thicken, which it didn’t because there just wasn’t enough fat in the half and half, so it ended up soupy, which I didn’t mind. The next day I added over a pound of button mushrooms which increased the intensity of the flavors. Over all I would definitely make this again.